The 56-year-old truck driver planned to buy a red Porsche with his winnings. A Brooklyn man is nearly $300 million richer than he was a month ago after winning the Powerball drawing. 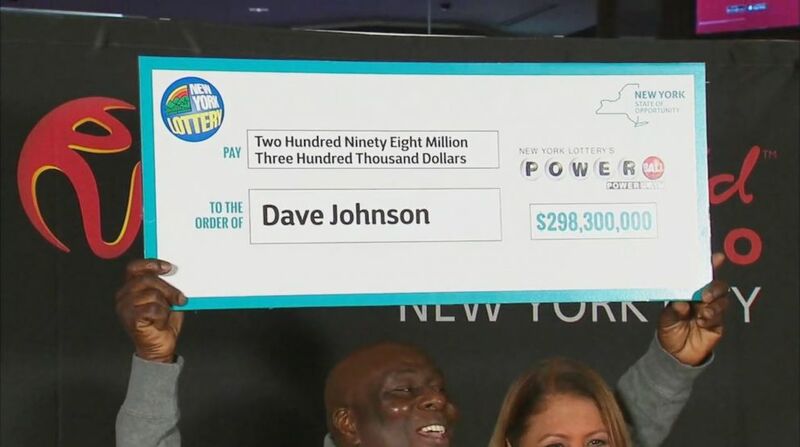 David Johnson, a 56-year-old truck driver, was presented on Friday with a check for $298.3 million by the New York Lottery, making him the winner of the second-largest jackpot in the lottery's history, according to Powerball. "I can't even eat. I start and can't finish my food," Johnson said during Friday's news conference at Resorts World Casino in Queens. "I'm happy with joy inside." He opted to take the lump-sum payment of $180,227,550, which means he'll go home with more than $114 million after the required withholdings. Johnson said he'd bought the $5 winning ticket -- with the numbers 5, 25, 38, 52, 67 and Powerball 24 -- at Arnold's Service Station across the street from his job at Iberia Food. (WABC) David Johnson, 56, of East New York, accepted his winnings from Yolanda Vega of the New York Lottery Friday at Resorts World Casino in Queens, Jan. 25, 2019. According to ABC station WABC-TV, Johnson didn't know he might have the winning ticket until he learned from a coworker that the gas station had sold it. Johnson said his friend urged him to check his numbers. Johnson, who moved to the U.S. from Jamaica at the age of 16, said he finally listened to his colleague and went to the gas station. He said he looked at the gas station's lottery display board, checked his numbers got the shock of a lifetime. "I jumped up and down in the store," Johnson said.